How do Cornwall's young farmers feel about Brexit? How do Cornwall’s young farmers feel about Brexit? For all of us, students to pensioners: it’s easy to get lost in the never-ending drama of Brexit. The subject has become such a well discussed and debated issue that many of us can’t bear to hear about it for a second longer. For some, it’s a non-worry. But for others? It’s a concern, no matter which outcome or ‘deal’ we are presented with on March 29th. Throughout many businesses in Cornwall, leaving the EU has developed into a stressful topic. Whether you voted Leave or Remain (or didn’t vote at all) back in 2016’s referendum, that isn’t really the concern here. Preparation is the word on everyone’s tongue, but how does anyone prepare for something when you don’t know for certain the outcome? In Cornwall, 10, 701 people are directly employed in agriculture, with the economy of the county remaining largely dependent on farming, closely followed by tourism. Cornwall is one of the four UK areas that qualifies for poverty-related grants from the EU’s ‘European Social Fund’. 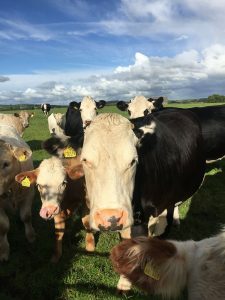 Objective One is the name given to the funding from the European Union, which, when it first began back in the early 2000’s was said to have largely supported a developing food and farming industry. However despite this, a report in 2015 found European Union funding failed to create an expected 10,000 new jobs in Cornwall, creating only 3557.
a group of around 700 people aged 10-26, almost all of the next generation of Cornwall’s farmers attend the weekly group meetings and activities held different clubs around the county. Interestingly, not all young farmers have the same opinions on Brexit, which becomes clear as we talk to young farmers about their views on Brexit.